Don’t let the numbers mislead you. The recent rise in rough diamond prices is no indication of an increase in polished diamond prices. Despite the recent hike in rough diamond prices, the polished diamond market remains stable. Demand is selective, but there’s no sense of urgency on behalf of buyers. Polished suppliers were therefore a bit perplexed when DeBeers raised prices by approximately 4% at its May sight. When rough diamond prices go up, and polished diamond prices stay the same, it lessens the profit margin for diamond manufacturers. With rough diamond markets feeling the pressure, trading has significantly declined. Due to these circumstances, sightholders have taken somewhat of a defensive position. If the trend persists, sightholders may begin to reject goods. But many have adopted a “watch and wait” strategy. Indian factories are either closed or operating at reduced capacity during the Summer Holiday, while US and far Eastern markets remain stable at best. However, the feeling seems to be that demand will improve by August, when the current rough diamond supply comes to market, as polished. Yet all eyes remain on sightholders to see if they’re prepared to sustain the current conditions. Mining companies are counting the market rejuvenating. They realize that high prices cannot be sustained, and the disconnect between rough and polished diamonds can stretch only so far. Mining disruptions in South Africa have led to a shortage of low-end rough diamonds in India. This shortage has led to a substantial price increase in the last two months. The segment affected most were sizes 0.10-0.50 carats, which saw heightened demand during the wedding season. “Worldwide, the demand for diamonds is far higher than the current production, leading to a shortage,” summarizes Mehul Choksi Managing Director of Gitanjali Gems, one of India’s most prominent manufacturers and retailers. “ It’s expected that prices will normalize in June. U.S. chain-store sales rose 4.3 percent year on year for the week that ended on June 1. Weekly comparable-store sales rose 1.9 percent, although mainly due to the Memorial Day holiday weekend. U.S. chain-store sales rose 2.2 percent year on year for the week that ended on June 8, according to the International Council of Shopping Centers (ICSC) and Goldman Sachs. In response, US diamond demand is expected to rise. “Unlike other commodities, the US rather than China dominates the diamond market by some distance, with 37% of last year’s demand. With that economy steadily improving we expect a rebound in diamond demand,” says Turner. Polished prices could see an uplift ahead of the key Thanksgiving and Christmas season. “While some investors may be concerned about a slowdown in China, the outlook for diamonds remains positive, driven by the rebalancing of the economy from investment to consumption and favorable demographic and diamond buying trends”. Rio Tinto is delighted to reveal the release of its limited edition pink diamond ingot to commemorate the opening of the Argyle Underground Mine. Hand set in a 1 ounce bed of pink gold, crafted by The Perth Mint, these diamonds were formed over a billion years ago under ancient Boab Trees of Western Australia. As a symbol of origin, the ingot depicts a Boab Tree, embedded with six Argyle pink Diamonds. “We are delighted to partner with The Perth Mint on the exclusive release of this distinctive investment piece. It is a beautiful symbol of the unique Argyle story and the recent milestone commencement of underground mining” said Kim Truter, the managing director of the Argyle Diamond Mine. 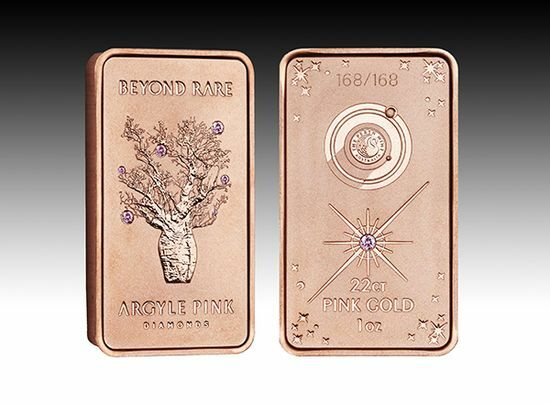 The Limited Edition Argyle Pink Diamond Ingot is available at The Perth Mint. Mark Rubenstein, a resident of Coral Springs, FL, was hunting for pythons in the Everglades when he came across a small gleaming object. The gold, sapphire, and diamond jewel was partially melted, with no traces of ownership. 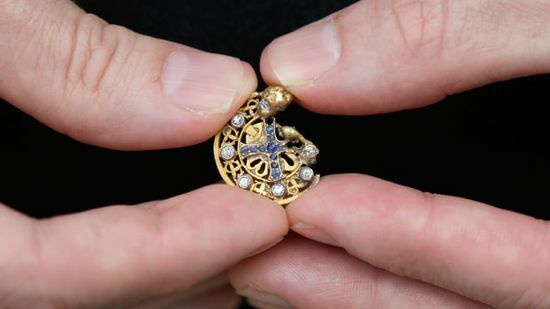 Stephen Walker, a jeweler based in Andover NY, is helping Rubenstien to find the original owner. The backstory is a mystery, because where he found it is in a debris field of one plane crash, a 1972 crash, and only a few hundred yards from where a ValuJet went down in 1996. Rubenstein posted an image of the piece in a jewelry forum. The image left experts perplexed, with only a hunch that it might be Eastern, Greek, or Russian. Rubenstein joned forces with jewelry expert Stephen Walker, and started a campaign to find the true owner of the rare piece. Walker is leading the search, by investigating the plane crash, and whether or not it belonged to a passenger. Walker is now working with a retired law enforcement investigator to help ensure that the piece ends up in the hands of the owner’s family. “We’re thinking we’ve got to get this where people can see it so someone can say, ‘Oh that belonged to my aunt’ or something,” he said. He is collecting leads through his jewelry business, Walker Metalsmiths in Andover. Black Diamond Beauty Cream for Anti-Aging? Diamonds may already be a girl’s best friend, but black diamonds could be about to prove theirselves even more precious. Thousands have been on the waiting list for a face serum which contains particles of the rare gem. It claims to leave skin smoother, brighter and, well, sparkling with youth. Like the more common white diamond, black diamonds have properties that boost the supply of collagen – the elastic substance which diminishes with age, causing the skin to sag and wrinkle. But unlike their paler counterparts, which reflect and bounce away light, black diamonds absorb and manipulate it, helping even out skin tone and improve the complexion, say the makers. Created from particles of ground black diamonds, which are found in central Africa and Brazil, the serum works by targeting the base of the skin’s epidermis. This in turn is stimulated and strengthened because the cream helps boost collagen and inhibits the destruction of enzymes which protect against environmental damage, such as the sun’s rays. In clinical trials on around 1 000 women, the black diamond serum was said to reduce fine lines and wrinkles by up to 65 percent in just 28 days. But of course, all of this comes at a price – £90 (about R1 330) for a 30ml bottle, to be precise. 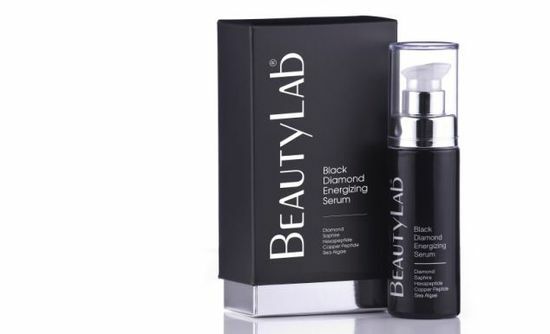 Skincare specialist BeautyLab, which created the product, said: “Our serum is unique because we’ve managed to harness the power of the rare black diamond for the first time.” The cream is on sale at BeautyLab.co.uk.